Oil is up some 7-8% from recent lows. 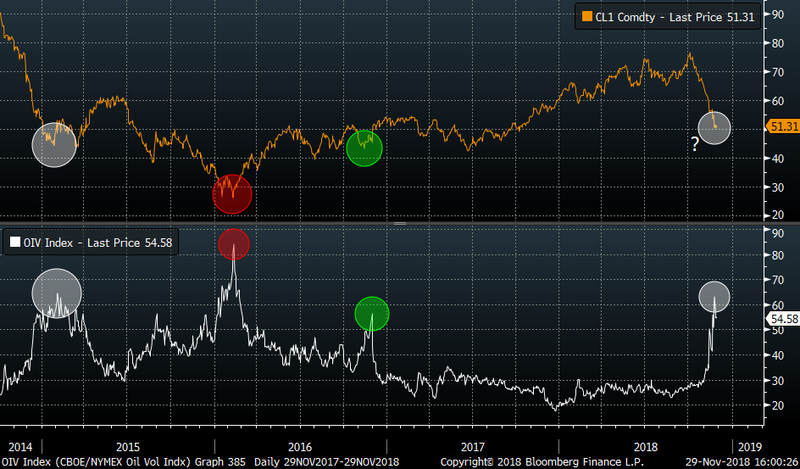 We are not calling a new bull market in oil, but the bounce has definitely taken many by surprise, and risks new “fundamental” shorts getting smoked as oil continues trading higher, now getting an extra boost by the weakening USD. The shorter-term chart from the October highs. Note the negative trend right around these levels. 55 USD is the first big resistance to watch. The OIV index has come off sharply over past sessions. Gold, also a huge USD play, continues pushing higher and was a great USD sell off hedge. The yellow metal continues trading in the channel from August lows. It has had “problems” closing above the 1235 ish resistance, but is currently trading above that level. Watch the close carefully here. Gold is still a hated asset and positioning of the crowds is all but bullish. Net non-commercial futures positions below. Gold miners, GDX US, is another space that has been hated and dull for a long time. Watch the negative red trend line for a possible break out. A break out could prove to be rather violent.